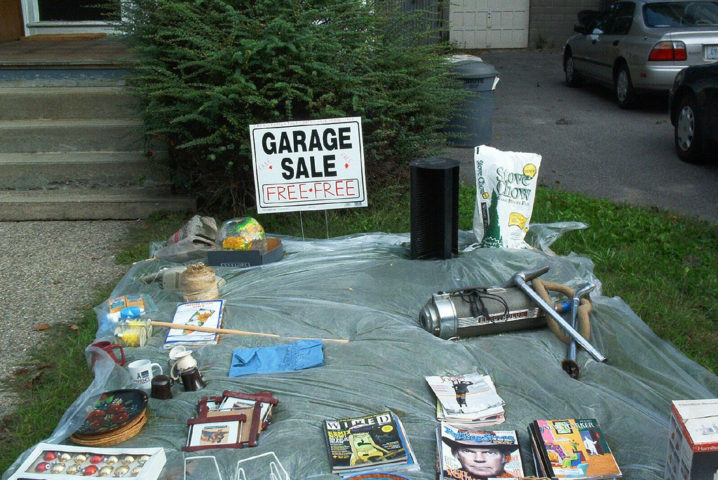 One of the best things you can do at your yard sale is to give away some items for FREE. And don’t be shy about making a big deal of it! I actually like to have an entire section of free stuff. When it comes right down to it, you know that everything you have is not going to sell. So why not try to guess which of your items are LEAST likely to sell & just offer those for free right from the beginning? You want them out of your house anyway, right? Make someone’s day by giving those things away for free! Only those who are truly interested in the free items will actually ask about them and take them anyway. So, it’s a win-win — you only get the serious inquiries for your free stuff, and you both feel good about giving & receiving something for nothing. I’m not kidding… people are usually so shocked to see something for free, that they simply don’t believe it. So this is a fun thing to be associated with! Plus, giving things away for free always generates more attention to your yard sale. That’s right, the people who are passing by will be more likely to “notice” your sale — from the FREE signs… to the multitude of people actively engaged & looking at items you’re selling (or giving away)… to the fact that people are leaving your sale with items in their hands. More attention means more shoppers — and more sales! I’ve been offering free stuff at my garage sales for years. It’s always a hit. Initially, I started with just one oversized bowl filled with Happy Meal-type toys and odds & ends — for kids. These days, I tend to have a whole section of freebies filled with trinkets — for people of all ages. Old magazines, books, maps & fliers. Even though they don’t have any real value — someone might enjoy them. Free samples you’ve received as gifts or in the mail. Believe it or not, serious yardsalers will intentionally sign up for free samples just to have freebies to hand out at their yard sales. Plants from your garden. Maybe you’ve thinned out your daylilies or lilacs. Most people will pay 25-cents apiece per plant/bulb, or you could just give them away. Old plastic trays and containers that plants come in. These make great starter materials for gardeners who begin their gardens indoors by planting & germinating seeds indoors before moving them outside. Reusable shopping bags. Have a few of them lying around that you never use? (I do.) Other people cherish these items and would love to put them to good use. Broken but still valuable items. Sometimes I’ll offer something that’s broken — but still valuable to many people — as a freebie. For example: a weedwacker that leaks oil, a digital camera that I dropped and now it doesn’t work, old cell phones — even if they’re screens are cracked, teenagers love to get their hands on these! Makeup that you’ve tried but didn’t like. I’d feel funny selling makeup items that I’ve already used, but I’ve given away lots of trial size ones that I’ve received, as well as full-size versions that I just didn’t like the color or the results. Pet toys that are well-used. The ones that have very few signs of wear & tear, I sell. But if they’ve clearly been used and abused, others will take ’em for free. Think dog foster parents, animal shelter workers, and brand new pet parents on a budget. Homemade snacks. Bake some cookies, make some candy, or bake cupcakes or muffins and hand out one per person until they’re gone. You may only want to do this when the crowds start to dwindle — because it will help to attract more shoppers! Don’t want to give them away? Then sell them for 25 cents apiece and make a few dollars for your efforts! Anything you happen to have a lot of on hand. For example, one time I put out boxes and bags of all shapes and sizes that I was tired of storing in my attic. You never know who can use those items. Someone might have a home business (like selling jewelry on Etsy) that requires them to ship items through the mail in decent looking (or decorative) boxes. Plastic bowls & lids that you’ve held onto for years. Even those freebie ones that come with frozen meals! Crafters and parents with young children typically have a million uses for these kinds of items. When it comes to freebies… one man’s trash truly can be another man’s treasure. Your yard sale just might make someone’s day! I’ve learned that the odds of this happening are pretty slim, but I know — you still don’t want one or two people to walk away with the majority of the items you’re offering for free. You want as many people as possible to benefit from those things, right? Well, believe it or not… most people feel uncomfortable “taking” more than one free item at at time. Trust me, I’ve been offering freebies at my yard sales for years, and rarely does one person ever walk away with 2 (or more) freebies. It just doesn’t happen. Still, you might want to post a sign that says, “ONE PER PERSON, PLEASE” — like I did with the wheat pennies. For what it’s worth, I usually put the valuable freebies on a blanket (or tarp) on the ground near the check-out. 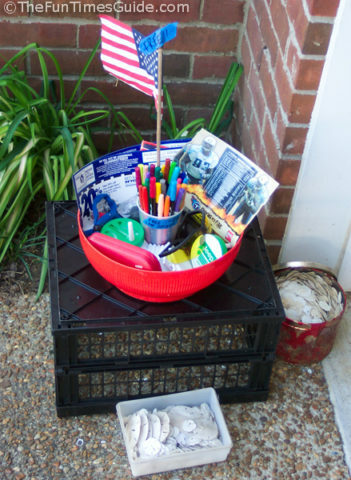 And I put the cheapo freebies (usually for little kids) in big bowls on a table near the check-out. That way, I can keep a pretty good eye on what’s leaving those areas.